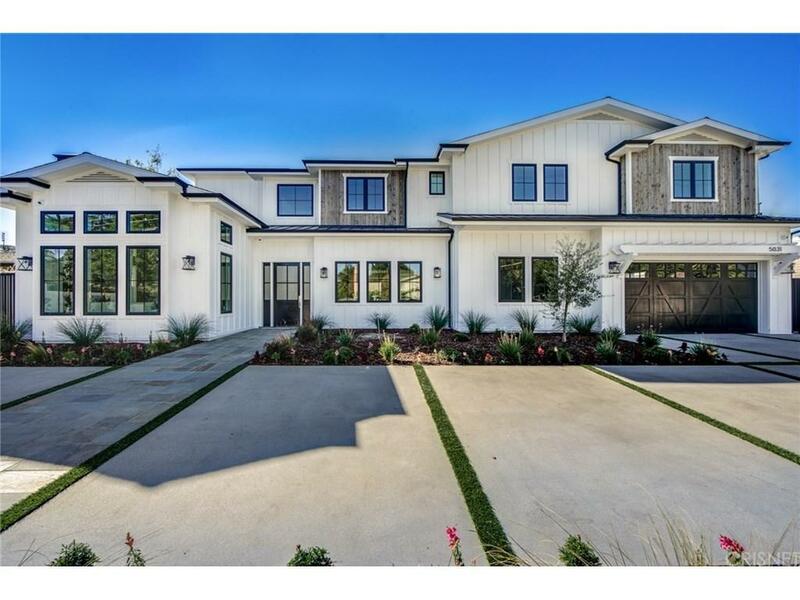 A new-built Contemporary Farmhouse Estate located in the heart of Encino on a perfectly situated lot measuring over 18,000 SF. Enter this gated estate with a circular driveway to explore this magnificent craftsmanship reminiscent of a Hew Hamptons Farmhouse. A chef's kitchen with a huge pantry, Sub-Zero fridge, custom tile work, and a huge center island, opens up to a family room with a modern fireplace, surround sound and pocket patio doors for a seamless indoor / outdoor experience. Complimented with stunning wood floors, a main level office, a home theatre, and a grand living room, this estate is suited for every day comfort and luxury as well as entertaining large gatherings of family and friends. Enjoy the oversized master suite with a fireplace, walk-in closet, a stunning master bath, and a large balcony that overlooks a lush backyard, pool & spa, and a colorful sunset in the afternoons. The magnificent backyard features a basketball half court, pool & spa, a cabana, exterior kitchen & bar, fire-pit, and endless lawn. Excellent location within the Hesby oaks school district, minutes from the 101 / 405 FWY, and just a short walk from trendy Ventura BLVD. Sold by Zeev Perez BRE#01500254 of Keller Williams Encino-Sherman. Listing provided courtesy of Kobi Costa DRE#01500254 of Coldwell Banker Calabasas.